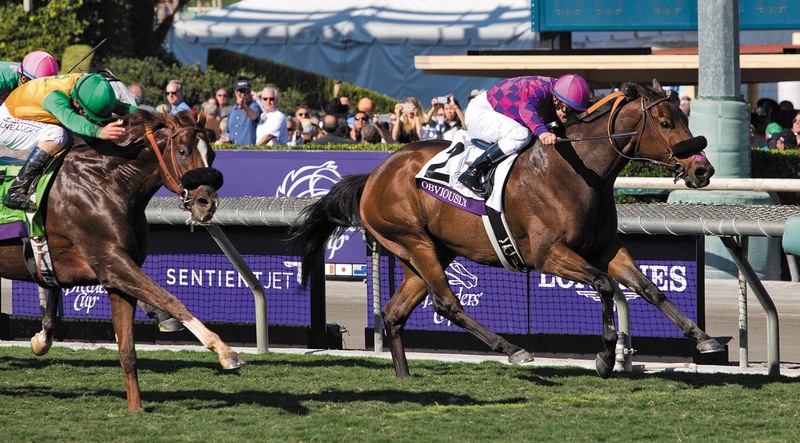 For those of us fascinated by thoroughbred pedigrees the Breeders’ Cup wins by Obviously (IRE) and Highland Reel (IRE) provide plenty of food for thought. Both have an Aussie connection and share plenty of the same horses as ancestors, but their aptitudes could not be more diverse. 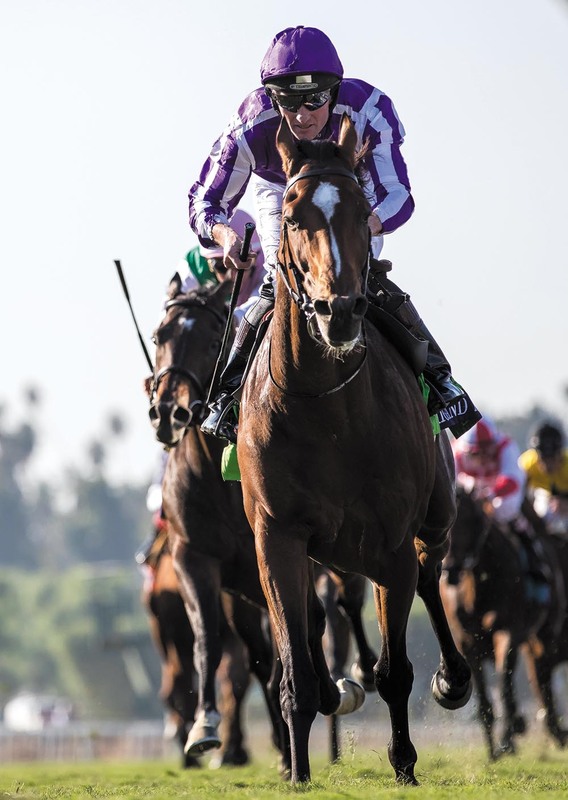 Obviously, a gelded eight year-old son of Choisir, won the $US1m BC Turf Sprint-Gr.1 (6.5f) at Santa Anita by a nose, while Highland Reel, a four year-old entire by Galileo (IRE) and from a sister to Elvstroem, won the $US4m Breeders’ Cup Turf-Gr.1 (12f) by 1.75 lengths to add to the King George VI and Queen Elizabeth Stakes-Gr.1 (12f) win at Royal Ascot earlier in the year. Both their sires are owned by Coolmore, Choisir, a reverse shuttler, is a mainstay on the Jerrys Plains roster, while Galileo is the current undisputed champion sire in Europe from his base in Ireland. He briefly shuttled in the early stages of his career. Obviously, whose best effort in four earlier attempts at the BC Mile was a third at Santa Anita as a four year-old, is also a dual winner of the Shoemaker Mile-Gr.1 at Hollywood Park and he set a new mile course record (1:32.1) at Del Mar in 2012 when he won the Del Mar Mile-Gr.2. His sire Choisir (Danehill Dancer (IRE)-Great Selection by Lunchtime (GB)), whose second dam is by Biscay, was the first of the Australian bred and trained international sprint champions after winning the King’s Stand-Gr.2 and Golden Jubilee-Gr.1 at Royal Ascot in 2003, a path followed by his son Starspangledbanner (also on the Coolmore roster) who went on to win the Golden Jubilee-Gr.1 and Newmarket July Cup-Gr.1. Obviously’s dam Leala is a daughter of another former Coolmore shuttler in Montjeu (IRE) (Sadler’s Wells-Floripides by Top Ville) and from Silver Bubble (by the Roberto son Silver Hawk). Highland Reel, who won the Secretariat Stakes-Gr.1 and Hong Kong Vase-Gr.1 at three when he was also runner-up in the French Derby-Gr.1 and third in the Cox Plate-Gr.1, has been in great form this year for his Coolmore syndicate of owners and as well as his two Gr.1 wins, he was also runner up in the Juddmonte International-Gr.1 and Arc de Triomphe-Gr.1. His pedigree is almost a reverse of Obviously. Gallileo, like Montjeu, is a son of Sadler’s Wells and he is from the Miswaki (Mr. Prospector) mare Urban Sea. Highland Reel’s Gr.1 placed dam Hveger is by Choisir’s grandsire Danehill (USA) (Danzig-Razyana by His Majesty) and from Gr.1 winner Circles of Gold (Marscay-Olympic Aim by Zamazaan). Marscay of course is a Golden Slipper-winning son of the brilliant sprinter Biscay (Star Kingdom (IRE)), sire of Choisir’s second dam. Hveger’s second dam Olympic Aim is also the third dam of Starspangledbanner (ex Gold Anthem, by the Noholme-line sire Made of Gold (USA)). Hveger’s dam Circles of Gold, who died at age 25 in early November, is an exceptional modern broodmare and the Australian Oaks-Gr.1 winner and $1m earner is also dam of two international Gr.1 winners among her 12 named foals, notably champion older horse Elvstroem (Danehill), winner of the Victoria Derby, Caulfield Cup, Orr Stakes and Underwood Stakes in Australia and the Dubai Duty Free-Gr.1 at Nad al Sheba. He is now at stud in France after starting his breeding career in Victoria. His half-brother Haradasun (Fusaichi Pegasus (USA)) won the Doncaster-Gr.1 and George Ryder-Gr.1 locally before transferring to Aidan O’Brien in Ireland where he won the Queen Anne Stakes-Gr.1 (8f) at Royal Ascot. He stood at Coolmore, Jerrys Plains before moving to Grangewilliam Stud in NZ in 2014. Circles of Gold died at her long-time home, Segenhoe Stud, on November 9 and the stud’s general manager Peter O’Brien described her as “a beautifully quiet mare and one of a kind whose exploits through her daughters and granddaughters will continue on for many years to come”. Hveger could easily outdo her dam as she has a 2015 Galileo filly and a 2016 colt by that sire in the pipeline as well as her 2014 Galileo filly Cercle de la Vie (a 460,000 guineas Tattersalls yearling in 2015). Then there is the talented three year-old Idaho (Galileo), a Gr.2 winner who was runner-up in the Irish Derby-Gr.1 and third in the English Derby-Gr.1 this year. Hveger’s 2006 Australian born daughter Valdemoro (Encosta de Lago), a dual winner based at Milburn Creek Stud, was runner-up in the 2009 VRC Oaks-Gr.1 and 2010 Vinery Stud Stakes-Gr.1 and is the dam of gelded city winner Kesan (Choisir), current juvenile filly Via Veneto (All Too Hard) and foaled a Savabeel colt in 2016. 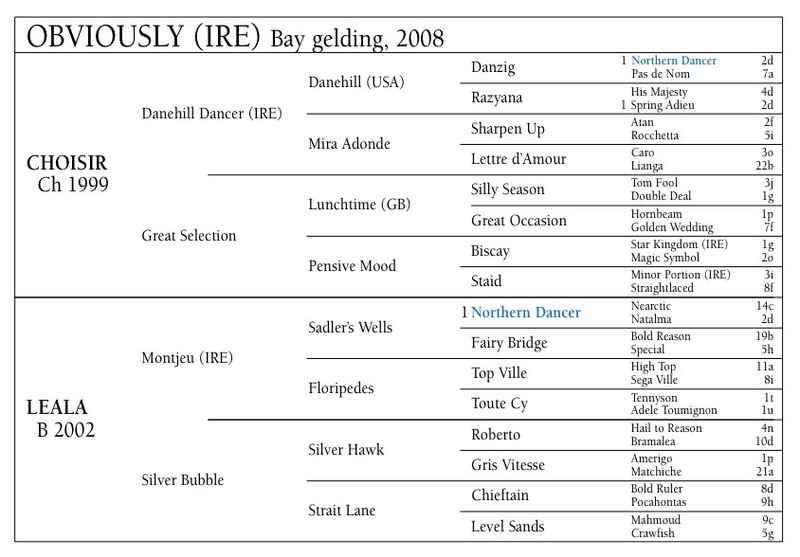 To summarise, Highland Reel is by a son of Sadler’s Wells from a mare bred on the Danehill/Biscay cross while Obviously is by a sire bred on the Danehill/Biscay cross, while his dam is by a son of Sadler’s Wells. 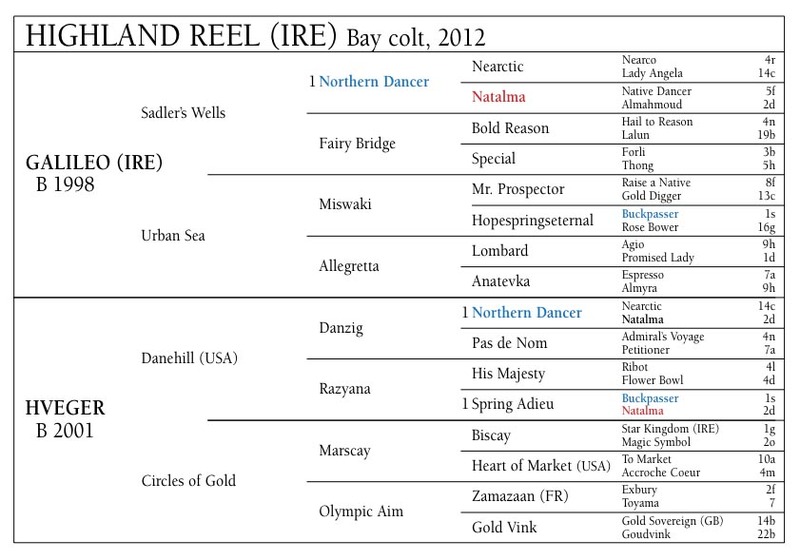 To add further interest, Danehill Dancer carries Native Dancer 4f,4fx4m,5m and this breed shaper also features in Highland Reel’s pedigree via his daughter Natalma (dam of Northern Dancer and third dam of Danehill) and his son Raise a Native (grandsire of Mr. Prospector). Shuttle sires, what are they good for? So You Think a classic outcross for the Danehill line?